The Biblical World: BC/AD or BCE/CE? Apparently there has been quite a debate in the UK over the BBC issuing a decree that all reports will no longer use BC and AD when referring to a year, but BCE and CE. The BBC has been accused by some of "writing Christianity out of history." Before I go any further I will note that the EChruch Blog has shown that this report is false. So there is no need for the peasants to storm the BBC castle. The BBC has issued a statement saying that both BC/AD and BCE/CE are acceptable (wow what a mouthful). But what is it about four letters after a few numbers that has some in an uproar and what is at stake here? For those who are not aware, BC stands for Before Christ and AD, from the Latin Anno Domini, Year of our Lord. The two dates are intended to mark time before and after the birth of Jesus. There is no year 0, AD begins with year 1. BCE, on the other hand, means Before the Common Era and CE means Common Era. But CE has also meant Current Era and sometimes Christian Era, though very infrequently. BCE and CE are used quite often by biblical scholars. One reason for this usage rather than BC/AD is because we work with many Jewish and Muslim scholars with whom we share sacred texts, but not the same conviction that it is the year of our lord. Yet some people see this as a betrayal of Christian values and that some how biblical scholars are denying the significance of the birth of Jesus and succumbing to the forces of secularization. But such accusations are not only incorrect, they are misinformed. The way that years are calculated internationally (i.e. 2011) is the result of the western, Gregorian Calendar which was introduced by Pope Gregory in 1582. 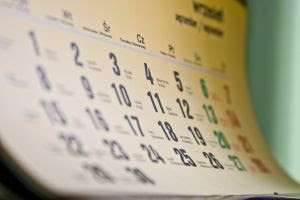 Prior to that the western world used the Julian Calendar, which was established by Julius Caesar in 45 BCE. So in the grand scheme of things, the current way calculating years is new. In fact, it was only in the twentieth century that it began to be the dominate calendar. The calendar is wrong by about four years. Jesus was not born in 1 AD/CE, but 4 0r 6 BC/BCE. This has been known for sometime now, but I don't think anyone is suggesting we adjust the system. We often forget that there are other calendars that are still being used. The Chinese have their own way of calculating the years and there is also the Jewish calendar, to name two. What this means is that often we are not promoting Christianity but rather the western way of calculating time. I use both systems. For the most part I use BCE and CE, but I will use BC and AD if I sense that my audience might object. Both work for me. But I think Christians do themselves a disservice when they insist that everyone should recognize that the world is living in a particular year of the Christian Lord. I think we would be better off living as that Lord commanded us rather than beating others over the head with a calendar. I think we would be better off living as that Lord commanded us rather than beating others over the head with a calendar. Everyone knows that it's the year 5772. I'm always confused though whether that's CE or AD. Would you clarify? I do find it ironic that the referent is the same; changing the term does not change that fact. This to me is disgusting. Secular people are trying to write Christiantiy out of History. Liberal Christians are blindly and stupidly letting them. The Gregorian calender is a Christian calender. If liberal fools don't wish to use the terms BC and AD then maybe they should invent their own calender and stop hijacking ours.